China has a dynamic job market that has distinct career advantages at the entry level if you are ambitious and enterprising, and at the senior level if you are experienced. In my experience, the opportunity to live and work in a totally different culture and environment is the biggest reward, and going to work in China is quite an adventure for most people. With the rate at which Chinese are learning English far outpacing the number of new Mandarin learners, it is no longer easy to find jobs just because you speak English. Being proficient in Chinese or at least demonstrating the intent to learn is crucial for you to show recruiters that you are invested in the country and intend to stay. Furthermore, you will want to learn Chinese if you are to make the most of your opportunity to experience this transformative period in the development the Chinese economy. To find a good job in China, you usually need to be able to apply language and cross-cultural communication skills to a specific profession. Check out this list of the top eight job markets for foreigners, so you can get an idea of some of the best places learning Chinese can lead. Marketing specialists are in high demand in a number of different sectors, with IT offering some of the most inviting opportunities. Rapidly growing Internet companies want creative individuals to work on global marketing campaigns and help them target their brand language. Well-known companies like Alibaba and Xiaomi have hired large numbers of foreign professionals in marketing roles for everything from project management to social media, and will continue to do so. Foreigners working at large Chinese multinationals such as Lenovo may have more responsibilities in managing cross-cultural communication between different stakeholders within the company than actual hands-on experience in direct-to-consumer marketing. While startups don’t have the resources of Chinese tech giants, their demand for international talent is also strong, as they stand to gain the most by getting their first foreigner on board. Key skills for getting a job at a Chinese startup are SEO, SEM, design, and networking abilities (think large Internet conventions and introducing yourself in Chinese). Being familiar with technology is a plus for doing everything from editing product manuals to figuring out how to get your company on TechCrunch. However, succeeding at this job in the long run also takes cross-cultural communication skills, as the real challenge is in bridging the gaps that make marketing approaches in China and the West very different. The local advertising and PR industries are also very important businesses in China’s major cities, and there are many Chinese advertising agencies that specialize in campaigns such as offline events which are much less common in Western countries. However, event organizing agencies serving big auto clients often hire foreign employees both for correspondence with foreign clients and for fresh ideas that would add to the company’s creative approach. China is a great place for editors looking to gain unique experience, and there are quite a few different options for copywriters. Major cities have many media companies looking to broadcast China’s events to the rest of the world. In addition, there are many foreign news syndicates that provide specialized information on industries in China like finance or tech to high-end subscribers. Chinese skills are definitely a plus in an environment where your key function is to make information from Chinese sources clear and engaging to a Western audience. Editors do not have to be able to translate, as many news syndicates look for English editors to polish articles that have already been translated. In my experience editing for Chinese media, I was able to learn a lot of Chinese in the process of aiding Chinese co-workers responsible for translating. Entry-level editing jobs in a city with a lot of news syndicates like Beijing or Shanghai usually pay as much as teaching English jobs at a training center but are much less demanding. Journalism is also a natural transition for English teachers, and generally less stressful than other professions. However, you can expect to have weird hours working at Chinese news syndicates that distribute news 24/7 around the globe. China is a very engineering-oriented country due to the high number of infrastructure projects it has domestically and abroad, as well as its strong IT and manufacturing sectors. China still needs foreign engineers of all types despite its large numbers of engineering graduates. Foreign engineers can help negotiate differences in engineering practices between different countries, as well as manage global projects. Renewable energy, oil and gas, automotive manufacturers, and heavy industry are important areas in which both Chinese and multinational corporations employ many foreigners. Particularly in environmental technology, China is looking for driven engineers to help develop solutions to pollution and sustainable development. As the dominant manufacturer of solar panels, China is forward-looking in many aspects of modern engineering, making it an exciting place to work. Engineers are often transferred to China by foreign multinationals who provide expat packages. Expertise in the right area can offer very high compensation and comprehensive benefits. Alternatively, China is also a good place to start studying for a masters in engineering, as many major universities are offering degrees taught entirely in English. Studying abroad allows for time to perfect Chinese skills relevant to your profession, and increase the leverage of your technical skills. Like other engineering jobs, computer science may seem like a crowded profession in China. 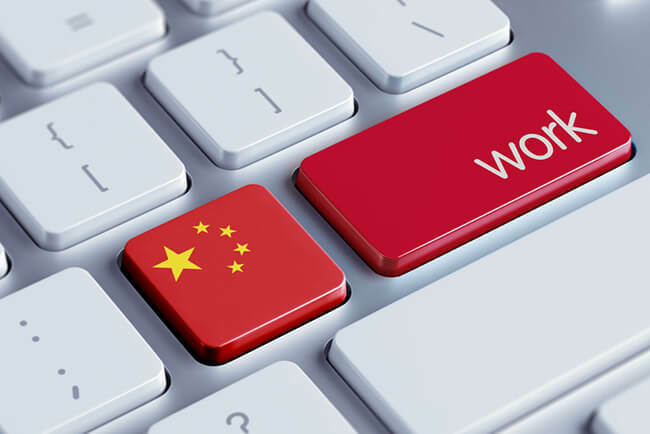 However, because of differences between the Chinese and global internet, foreign IT specialists are frequently in demand in China’s tech centers like Beijing, Shenzhen, and Guangzhou. Chinese tech companies facing the global market need engineers from different language backgrounds who understand global standards and design principles to grow their number of users abroad. China can be ideal if you have a natural talent in sales. As the largest untapped market in human history, China places an understandably high value on sales skills. Sales in finance and property to expat communities are reliable jobs. If you are more adventurous, seeking out opportunities as a trading manager in the import/export business can lead to your own venture. Chinese manufacturers are on the lookout for getting connected to a foreigner with good sales skills, so it is easy to make friendships if you have something to bring to the table in terms of making import/export sales. However, it takes a bit of creativity and knowledge about how to sell yourself to be able to cement the relationship. Successful foreigners in the import/export business rely on cross-cultural communication skills to network with the Chinese business community. Brush up on your conversational Chinese, know the basics of Chinese drinking culture, and learn number hand signals so you can get good at Chinese drinking games. Although the availability of high-level management jobs for foreigners has dwindled with increasing competition from Chinese nationals graduating from Western universities, the opportunities that do exist are very lucrative. Expat packages for management professionals look extremely high in comparison to the average income of expats living in China, but these jobs are reserved for senior candidates with a lot of experience and credentials in their industry. However, if you don’t have the credentials but have the ambition to get into management, China is a place where you can earn an MBA as a faster and more cheaply than elsewhere. While it is highly competitive for Chinese students to enroll in major institutions such as Beijing University (北大 běidà), Tsinghua University (清华大学 qīnghuádàxué), or Fudan University (复旦大学 fùdàndàxué), exchange programs make MBAs quite accessible to foreign students. Some foreign MBA students find management jobs before they graduate because they were able to network effectively during their MBA program. Chinese skills are an absolutely must in landing a management position, so don’t prolong learning Chinese either. Consulting companies are important in China because of their strategic position in helping Chinese companies globalize and foreign companies localize. Advertising consultants make top RMB because of the key role they play in making international business and communication more efficient. Tech consultants have arisen out of the tech boom by providing services such as product manual and marketing material translation and editing. Education consultants are also able to charge mind-blowing fees based on proven track records of getting Chinese teenagers into prestigious foreign schools. Spurring the growth of consulting in marketing, education, and all other industries is the need for cross-cultural communication specialists. Both large multinationals and smaller agencies hire foreigners with good people and language skills to add value to international business projects. Consulting may be one of the more glorious job opportunities in China as you may get to travel around to major cities and gain an understanding of how Chinese companies work. As with other professions for foreigners in China, you want to offer something unique in your skillset so that you can network with a strong value proposition. Although many Chinese professionals speak English, you add to the uniqueness of your expertise if you can speak better Chinese than they can English. In November of 1988, Da Shan(大山, Mark Rowswell) set foot on the stage on the annual 春晚 TV extravaganza and uttered his first 相声 (cross talk) words in front of half a billion Chinese opening the floodgates for many waves of foreign entertainers trying to follow his footsteps. Nowadays, all manner of singer, dancer, musician, magician, and comedian find work in China’s burgeoning entertainment scene, both on stage and TV. After doing almost all of these jobs on this list over 20 years in China, American magician and clown, Christopher Parsons, who goes by the stage name “Mr. Magic” (pictured at top competing on BTV’s “The China Hand Show” as Elvis), says he prefers live stage shows because of “the interaction with the crowd and getting to hear their laughter.” There are plenty of places you can hone your skills on stage such as Open Mic Night at the Comedy Club China and the Beijing Improv group; try out for a play at Beijing Playhouse or express yourself at Moonglow Burlesque. While English teaching is a means to an end for many expats who eventually want to enter a different field, education is one of China’s fastest growing and most profitable industries for foreigners. China’s rate of English learning is phenomenal, and you may have heard that the demand for English teachers to fill preschools is seemingly endless. However, education is just as opportune a field for professionals with education credentials as it is for young English teachers with no qualifications. Universities need academics to teach every subject in English, as do world-class private international high schools, English immersion schools, and elite private tutoring or education consulting companies. There are companies that also need instructors to teach their employees business English. While China places a similar value on education, its educational system is very different, making for diverse career opportunities and a great environment for cultural exchange.